Historic decision brings Ethiopian people of faith together in condemning the Meles regime’s interference in their religious practice. Ethiopian Muslims and Ethiopian Christians are creating history! Leaders of both faiths are now publically supporting the religious freedom of each other and with it, condemning the Ethiopian regime of Meles Zenawi for its interference in the religious practice of Ethiopians. Such interference has already taken a major toll on both groups. When the Meles regime appointed their own choice for patriarch over the Ethiopian Orthodox Church, it divided the church in two. As a result, many would not recognize the authority of the regime-controlled leadership and began a church in exile in the United States. The same situation exists for the Muslims although the resulting schisms co-exist within Ethiopia. Such splitting has created divisions within families, villages and ethnicities, disempowering the needed influence of the church and mosque in bringing righteous living and healing to a broken and alienated society. Leaders have been afraid to speak out for fear of repercussions; yet, the danger of not speaking out has suddenly become a greater threat than can be tolerated. In Ethiopia, the thinking has been, “I will not “move” if my neighbor’s hut is burning, but only if mine starts on fire.” Now, fire is reaching everywhere and Ethiopian religious leaders are taking some truly remarkable steps. Out of this common experience of persecution and regime interference in religious affairs, a new and promising union between Muslims and Christians is emerging. Ethiopians as a whole are deeply religious people who see their lives and destinies related to God. From the wealthy Ethiopian to the barefoot farmer in the rural areas of Ethiopia to the homeless beggar in Addis Ababa, most attend packed churches and mosques, believing in an Almighty God who is able to bring hope and promise despite a difficult existence. If these people really understand the truth, realize their God-given rights and demand change, this “sleeping giant” can rise up and free Ethiopia from the shackles of oppression overnight. What brought about this new partnership? In April of this year, the Ethiopian Orthodox Tewahedo Church became aware of the TPLF/EPRDF’s plans to demolish the fourth century Waldeba Monastery and eighteen churches in the Amhara region in order to make way for a regime-controlled sugar plantation. Their cry for justice was made, but not only by the Ethiopian Orthodox. It was clearly seen on the streets of Toronto when Ethiopian Muslims and Christian Evangelicals joined with Ethiopian Orthodox to condemn the regime’s plans and their interference in religious affairs. 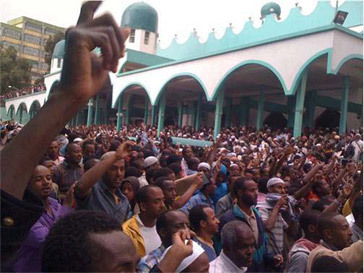 Over the last month, over a hundred thousand Muslims have taken to the streets in various places in Ethiopia to protest the TPLF/EPRDF regime’s plans to once again, for the third time, to appoint the regime’s own choice of leaders to the Supreme Islamic Council as well as to forcibly replace the moderate leaders within the Islamic schools with teachers of more extremist viewpoints in an effort to push a more extremist doctrine on Ethiopians who have always been moderate in their beliefs. As Ethiopian Muslim’s protested, Meles’ security troops opened fire on some of these peaceful protestors, killing seven. They have also tortured some of those they arrested. Now, in a historic decision, the head of the Ethiopian Orthodox Tewahedo Church of the Holy Synod in Exile, called upon all Orthodox believers to join their fellow Muslims in their protest against the unlawful intervention of the TPLF/EPRDF regime in their religious norms. They released a public statement saying that what their Ethiopian brothers and sisters were fighting for was the same as what they [Ethiopian Orthodox] were fighting for—a healthier society where people would be free to follow their beliefs and be able to live in unity and peace. Please see the link for the video: http://www.youtube.com/watch?v=Qd_U7NHZSng. This is the kind of society Ethiopians used to enjoy prior to this regime coming into power and promoting religious and ethnic division. Restoration of this respect and tolerance for the beliefs of others is long overdue. Their public statement of support is a rising ray of hope for the people of Ethiopia who are beginning to see through the regime’s divisive tactics. This is a beginning. This union and marriage between these people of differing faiths must not only be applauded but encouraged. This resolve to stand up for the church or the mosque to be true to its purpose of teaching the people to value righteousness—speaking the truth, valuing human life, upholding the basic rights of all people, speaking against evil and corruption, showing how to love God and neighbor—all can result in bringing life and liberty back to our society. When religious leaders fail to teach and encourage us to follow the higher path, we can get lost along the way or shirk our responsibility of living out God’s will in our lives. We are to be change agents for good. Even on Wikileaks it was reported in a document from the U.S. State Department that the Ethiopian Muslims have rejected this foreign practice of extremism. The Meles regime has slandered the image of Ethiopian Muslims by misrepresenting who they are in reality. The last thing they want is for people of different faiths to embrace each other as human beings first, with inherent worth. As a fundamental principle of the SMNE, we all must put humanity before ethnicity or any other difference in order to bring dignity back to our wounded society. We Ethiopians who know our unique past of mutual respect and peaceful relations understand that this tolerance between Muslims , Christians, Jews and others is not new to us, but we have fallen away from it partly because we have fallen for the regime’s divisive propaganda. Now our religious leaders are ready to model what it means to love God and neighbor because the mark of our Creator is on the face of each and every human being. This family reunion between the children of Abraham must reach to the people. Let us show the world that despite our differences we have more in common, our humanity. As we respect the humanity of our people it demands that we stand up for their protection and well being. Their protection is our protection. Their well being is our well being. No one is free until our brothers and sisters are free. This is the NEW Ethiopia for which these religious leaders are standing. What these religious leaders are now doing is something that the SMNE has been calling for in the past few years and we applaud this bold move at such a time as this. We are glad it has finally come and are more determined than ever to help make this dream come true. We are exploring possibilities of calling these religious leaders together for a Religious Forum on Ethiopia so these representatives of these different faiths can come together in one room to find ways to create a healthy, just and free country. The goal of this religious forum would be to advance this relationship so as to integrate these ideas into the daily lives within their communities so as to bring lasting change to the country. People of faith are stakeholders and the religious leaders are there to promote values, moral responsibilities, respect for others, honesty, integrity, love and unselfishness. Leaders like Martin Luther King, Ghandi, Archbishop Desmond Tutu, Nelson Mandela and others taught religious values as part of struggle for truth, justice and freedom from oppression. When the head of the family disciplines the children and teaches them their responsibilities, the family lives in greater peace; however, when the neighbors fight, their children stop playing together. When they reconcile, the children begin to play together again. When religious leaders stand together, so will the people and when the people stand together, it leads to mobilization and this is where change can begin. Religious leaders have a critical role to play in building and maintaining a healthy society for it requires spiritual transformation. Love, righteousness and service to others are best taught by people of the Book, not by politicians, and it can be passed on one person to another; however when our religious leaders model this for us, transformation can be accomplished more quickly. Right now, many Ethiopians may not understand the magnitude of what is happening, but God knows! As we build these bridges and as we accept and practice these principles of loving God and neighbor, we will truly be one family and one people. May God show us the way, the straight path, as the people of Cush stretch out their hands to God. Please do not hesitate to e-mail your comments to: media@solidaritymovement.org.